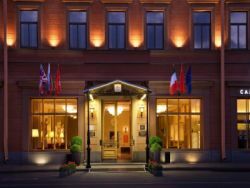 In Saint Petersburg, we'll be staying for 5 nights at the modern, luxury Angleterre Hotel. Conveniently located in the heart of the city next to the stunning Saint Isaac's Cathedral and just a short walk from Palace Square, the Hermitage and Nevsky Prospekt, the hotel features an on-site ATM, gym, sauna and solarium, an indoor pool, giftshops, on-site doctor, the Gallery offering space to relax with tea and coffee, and the chic Borsalino Restaurant for superb authentic Italian food. The 192 elegant rooms are recently renovated, most offering a breathtaking view of Saint Isaac's Cathedral, and include free Wi-Fi, air conditioning, interactive TV, in-room safe, minibar, and Italian marble bathrooms equipped with hand and power showers and bathtubs.